King spent years researching and writing In the Morning of Time, a novel that introduces the canon of Norse myths to young readers. Creation and destruction, raging battles, cursed rings and world-strangling sea serpents — she put it all in there. Rather than dumbing down the tangled tales of the medieval Icelanders — which inspired J.R.R. Tolkien, among others — King wove their strands into a single narrative. “I was trying to do what I thought T.H. White had done [with the Arthurian legends] with The Once and Future King,” says King, who’s now 84 and lives in West Lebanon, N.H.
King bought out the publisher and began selling remaining copies of the book on an individual basis. Now, 25 years after In the Morning of Time slipped out of print, she’s given it new life with the Authors Guild’s BackinPrint.com Program, which uses the services of print-on-demand giant iUniverse to make its members’ books newly available at no cost to the authors. Sometimes epic and lyrical, sometimes earthy and humorous, King’s book mirrors the various moods of the Norse sagas — which were blood drenched and densely plotted enough to inspire a dozen modern action movies. Scanned from one of the original paperbacks, the new edition contains Gustav Klimt-esque early illustrations by New Yorker Charles Mikolaycak, who would go on to win awards for his iconic reimaginings of myths and folktales. King, who obtained permission from Mikolaycak’s estate to use the images, is no stranger to the art world — specifically the Vermont art world. Her next book, which she plans also to publish through an Authors Guild POD program, is a retrospective of the life in art of Bethel sculptor Hugh Townley (1923-2008). “My husband and I had bought his work back in 1960 and been good friends ever since,” King recalls. She helped Townley’s wife, Mary Ross Townley, with her book projects and lived with the sculptor for the last five years of his life. Though her current home is across the state line, King still frequents the BigTown Gallery in Rochester, where she’ll do a book signing in September. A native of Manhattan, King still vividly remembers the years she spent retelling tales of the Norse gods and giants and trying them out on her three small sons. She hopes to sell some books to schools and a fantasy-loving new generation via the web — “I try to half keep up with the 21st century,” she says with a chuckle. But the tales, of course, have no time stamp. Much like us, the ancient Icelanders were fascinated by the end of the world, seeing it presaged in the eruptions of their volcanoes — whose power, King notes, we all just witnessed with Eyjafjallajökull. 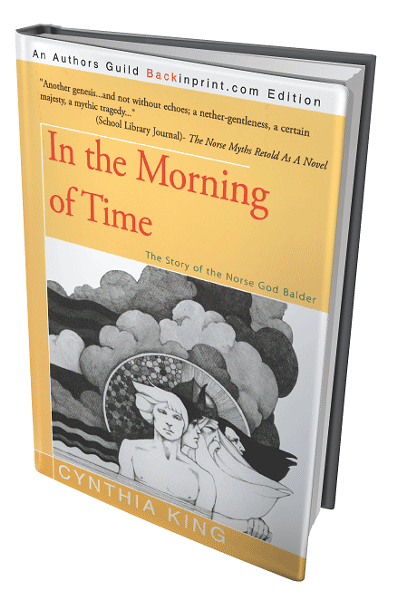 In the Morning of Time: The Story of the Norse God Balder by Cynthia King, iUniverse, 237 pages. $14.95. Order it through any bookstore or from bookorders@iuniverse.com (or 800-288-4677, ext. 5025). King reads and signs books on Sunday, September 12, 5:30-6:30 p.m. at BigTown Gallery, Rochester.